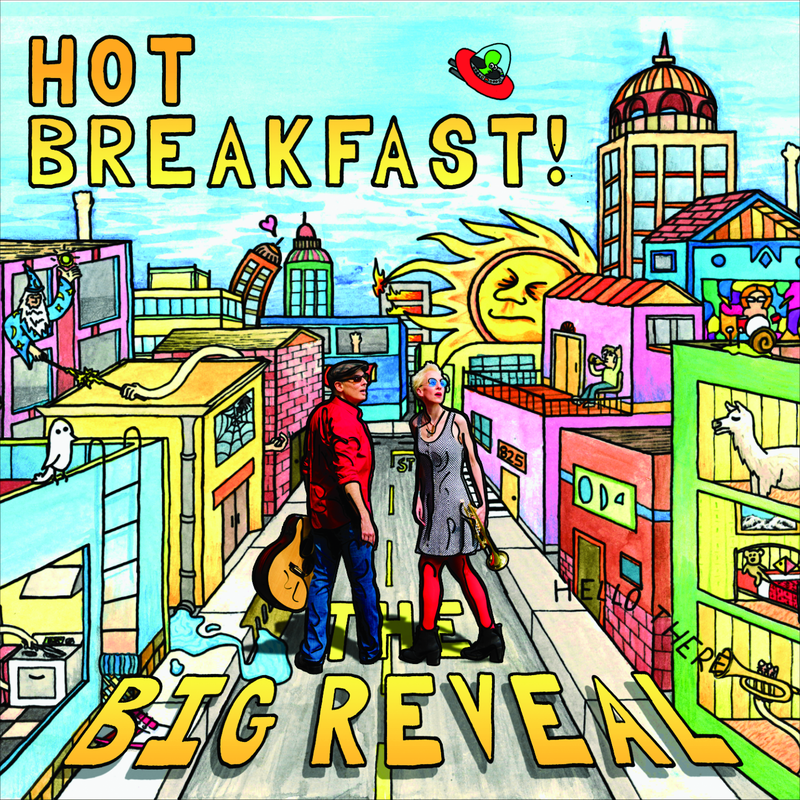 Album Review: Hot Breakfast, "The Big Reveal"
If there was ever an album that encapsulates the X Generation in the 21st Century, Hot Breakfast’s “The Big Reveal” is it. It’s not about how we were in the ‘80s and ‘90s (OK, it is a little bit), but how we are somehow grown up, being responsible at parties (Someone’s Got to Drive Larry Home) and listening to the same five records even though there’s a nearly endless supply of new music out there waiting to be downloaded (Too Many Choices). By the end, Matt Casarino (guitar and backing vocals) and Jill Knapp (lead vocals and percussion) have thrown up their hands and give in to the inevitable with Kids Today [Am I Right? ], a tongue-in-cheek(ish) lament about those damn, maybe doomed, Millennials. And it’s not just squarely GenX, it’s squarely Delaware GenX, featuring Delaware punk rock legends Jake and The Stiffs on New York Drama, a high-energy rock track that hits right in the middle of the album, just when the extra adrenaline is called for. (This is a real album meant to be listened to in order like music was intended to be listened to -- forget the Spotify shuffle.) As is their style, there is plenty of humor (and, even in songs like Kids Today and Nobody Matters but You, it doesn't come off as mean-spirited), but there is also a lot of sincerity, coming through most notably on the tracks Going Your Way and the particularly moving love song Ten More Years. 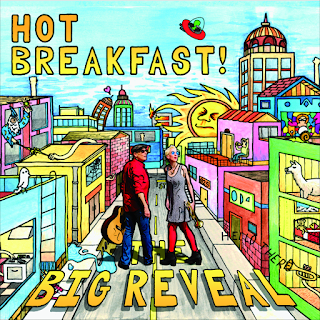 Stylistically, Hot Breakfast’s signature sound is “acoustic dork rock,” like a cross between ‘80s pop and ‘90s nerd alt-rock, with Knapp’s voice ranging from quirky and sarcastic to lilting and beautiful, yet it is a completely cohesive record. All in all, it’s an album that isn’t trying to impress the kids (something that feels rare for a rock album, even strange). They know their demo, and they speak to them, relatably and in no uncertain terms. They didn’t play Varese Tuesday night, but the Delaware Symphony Orchestra percussionists William Kerrigan, Thomas Blanchard and William Wozniak did offer a sonically and visually captivating program that offered a fantastic — and flawless — insight into the creativity and versatility of this powerful section of the orchestra. “Percussion Rules,” the third concert in the DSO’s chamber series, presented gems of the repertoire that had a little something for every taste and tilt: classical, avant garde, ragtime as well as a swig of Latin. The evening kicked off with Trio per uno (1999) by Serbian composer Nebojsa Zivkovic. This 20-minute work opened with a movement the composer aptly describes as a “wild archaic ritual.” This section had the three players gathered around a flat bass drum beating it obsessively with timbale sticks. This nervous pulsing on the bass drum was punctuated with unison thwacks from the pair of bongs and china-gongs allotted each player. Kerrigan, Blanchard and Wozniak offered a visceral and virtuosic performance that tapped an elemental strain of the human psyche. By contrast, the slow middle movement presented a slow, contemplative melody that served as a respite before the volcanic close: sheer speed and energy replete with guttural, primordial shouts. Stubernic (2000) by Mark Ford offered the trio another opportunity to showcase its prowess on a single instrument, this time the marimba. The Latin-inspired piece takes its name from Stefan and Mary K. Stuber, the composer’s former classmates who traveled extensively throughout Guatemala and Nicaragua. Moving around the instrument in circular motion — as if playing musical chairs — the three players dazzled the audience with their breakneck speed and tightly controlled ensemble work. Johnson soloed in the two outer movements and conducted the inner two which were for percussion alone. The first of the two inner movements featured nine tom-toms and a pod rattle which provided contrast with its periodic nervous rustling. The second scored for seven wood blocks was a waltz-like affair. Each half of the program closed with a performance of a traditional Guatemalan song, Lain Nebaj and Manzanilla, both of which evoked the warmth of the tropics on this mild spring evening. With the audience on its feet, the trio offered one last selection. Teaming once again with pianist Lura Johnson, they gave a rollicking rendition of George Hamilton Green’s xylophone rag Log Cabin Blues, with Kerrigan on xylophone and Wozniak on the drum set. Blanchard did the honors as sound effects man. Music about animals took center stage on Sunday when Piffaro brought “A Mummers’ Delight: A Renaissance Menagerie” to The Episcopal Church of Saints Andrew and Matthew in Wilmington. The Philadelphia-based early music ensemble is in the midst of celebrating its 30th anniversary season, and one of the ways it’s marking that milestone is by welcoming back guest artists from years past. This concert featured performers Mark Jaster and Sabrina Mandell, artistic directors of Washington, DC’s award-winning Happenstance Theater. Piffaro deployed its full panoply of instruments while Jaster and Mendell clowned and mimed their way through this rather silly — but highly entertaining — afternoon. Animals and animal sounds were extremely popular in the 16th Century. But animals make for dubious musicians. Only birds can actually sing; the rest make a buzzing, neighing, roaring racket. About the only thing music can do is capture the way the beast sounds or moves — which the members of Piffaro finessed quite nicely. Lively instrumental work depicted the darting motion of the butterfly in Pallavicino’s Una farfalla as well as the hopping motion of the flea in Bassano’s Note felice. Descending passages in Vecchi’s Il cocodrillo geme mimicked the slithering movements of the crocodile. Appropriately enough, this set also introduced the flattened s-shaped instrument called the lizard or lyserden, a tenor cornett with a foggy yet pleasing sound. Similarly, the contrasting tempos of The Apes dance at the Temple characterized the slow, often manic movements of the rustic animal. Sometimes the effect is downright silly as in Banchieri’s Contrapunto bestiale, in which a dog, a cat, an owl and a cuckoo battled for attention with their various calls. The cuckoo won out, becoming the star of the final selection in A Veritable Menagerie! It could also be impressive and clever like the realistic imitation of bird sounds in Gombert’s Le chant des oyseaux, one of the pieces that made onomatopoeic compositions popular all across Europe. Complementing the musical merriment was the kinetic energy and playful interaction of Mandell and Jaster. Mandell served as the maestro introducing each segment with a passage from literature. Jaster is a master mime, all-around clown and brilliant performer. Playing “the fool” to partner Mandell’s emcee, he entered with a “Do Not Feed” sign draping his derriere. Whether playing a dead goose, a chicken laying an egg, a hopping flea, taking a swipe at Mandell as a hissing cat or a cuckoo clock, he had the audience in stitches. But there was a soft side to him as well as when he portrayed the sad swan that dies singing or the dancing bear, forced to entertain the crowd. Just when you thought Icelandic music had nothing to offer beyond singer Bjork and post-rock band Sigur Ros, Mélomanie ups and offers a superb entree to the vibrant and varied musical traditions of this island nation. Sunday’s concert at The Delaware Contemporary (formerly The Delaware Center for the Contemporary Arts) featured internationally known Icelandic violinist Eva Ingolf on electric violin as well as two World Premieres by composer Mark Hagerty: Raven Thoughts (Hrafna Hugsanir) and Icelandic Songs, Sacred & Secular (Islensk log, helg og veraldlega). The concert kicked off with two rare gems by Scandinavian Baroque composers Johan Helmich Roman and Johan Aggrell. Roman was the first native Swedish composer of international influence, earning him the titles “the father of Swedish music” or “the Swedish Handel.” He traveled extensively throughout Europe, exposing himself to a variety of musical styles, chiefly from Handel and other contemporary Italian composers. The combination of flutist Kimberly Reighley, cellist Douglas McNames and violinist Christof Richter brought out the Neapolitan influence of Roman’s Trio in G minor with its restless harmonies and continually shifting melodic gestures. Mélomanie performs with guest artist Eva Ingolf (far right). Photo by Tim Bayard. Although less celebrated than Roman, Aggrell produced formally sophisticated music in a pleasing galant style. Reighley and Richter engaged in a spirited and expressive dialogue of his Sonata I in G major. Ingolf offered a performance of her own composition, Lava Flow, a sonic description of the 2011 eruption of Grimsvotn, Iceland’s most active volcano. Searing high notes and a violently cascading melodic line call to mind the magnitude of the event which was the largest in Iceland in 50 years. That performance warmed her up for the World Premiere of Mark Hagerty’s Raven Thoughts (Hrafna Hugsanir), a four-movement work for solo violin. The raven (or hrafn) is an important bird in Icelandic folklore. It is said that the Norse god Odin had two ravens that counseled him. Members of Mélomanie joined Ingolf in a performance of the program’s second World Premiere, Icelandic songs, sacred & secular (Islensk log heig og veraldlega) again by Mark Hagerty. It was Ingolf, whom the group met when they visited Rio in 2014, who introduced Hagerty to these traditional Icelandic songs that range in character from the robust to the elegant and hauntingly beautiful. Hagerty preserves the character of these folk songs with quintal harmonies while imbuing them with a contemporary texture. The coupling of Ingolf’s electric violin with Donna Fournier’s viola da gamba in the sixth song Raven’s Song (Krummavisur) was stunning. The work was a perfect expression of Mélomanie's mission: the paring of contemporary and early — in this case medieval — music. The only departure from the program’s Nordic theme was Partita 622, composed for Mélomanie (and included on its CD Excursions) by Mark Rimple. Written in 2008 following the death of his stepmother, the piece centers around the fascination she had with the number 622, which was reflected in the Gregorian and Hebrew calendars the day she died. Rimple structured the work around these three digits: the ritornellos appear six times, always a perfect fourth (2 + 2) higher before the composition ends, while the intervening passages are generated by multiples of and powers of 6 and 2. Although written at the time of a death, the piece is not a lament but rather the contemplation of a mystery, in this case, the complexities of life. The title “partita” represents the “starting out” on a journey. Melodic themes are frenetically tossed among the instruments in a dissonant soup, until at the apex of tension, the themes are gathered in a slow sarabande-like postlude as the mystery remains. Hip-hop artist Richard Raw performs. Dr. Lynnette Young Overby (Director of the Office of Undergraduate Research and Experiential Learning at the University of Delaware) and Colin Miller have created a multi-genre event that communicates hundreds of years of powerful, emotional history through dance, music, images, video, documentary footage and media interviews. 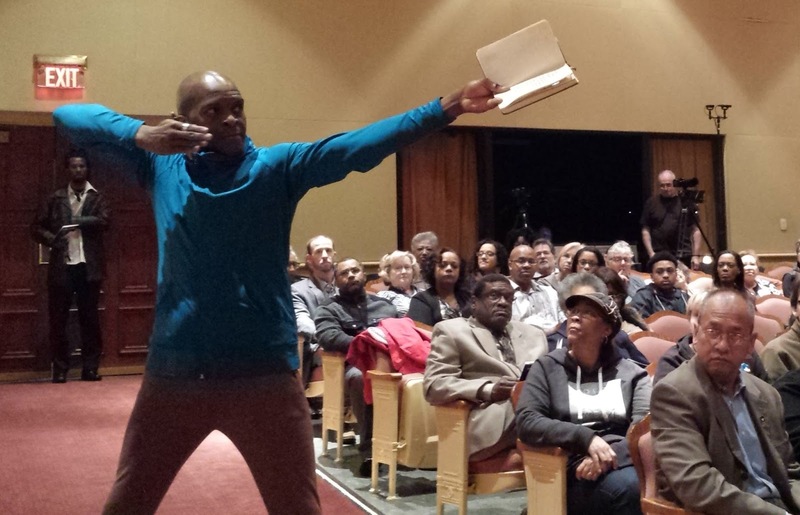 The University of Delaware Professor of Theatre and Dance (Overby) and the CAS Director of Global Arts (Miller) gathered dancers from the U.S. and South Africa to explore the tumultuous racial strife of each country. The project, Same Story Different Countries – From oppression to resilience to liberation in South Africa and the United States – takes the audience on a journey from the African Savannah to slave plantations in the U.S. to civil rights struggles in both the U.S. and South Africa. The primary form of communication in the show is dance. Dozens of dancers transform the stage, expressing the joy of community, the pain of oppression, the strength of character, the outrage at injustice, and the determination of a spirit that continues regardless of ignorance and violence. 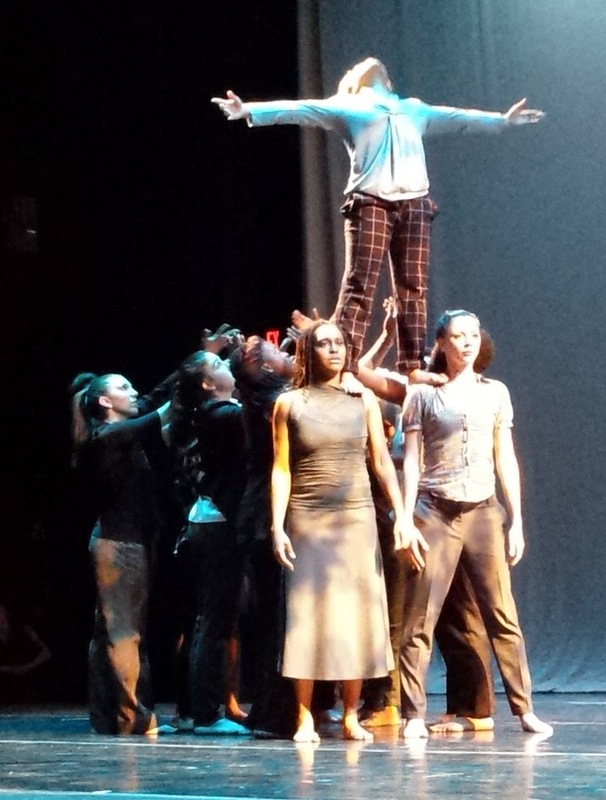 While the dancers were performing to music provided by a soundtrack or beautiful live voices, there was one segment performed to the sound of testimonies before the Greensboro Truth and Reconciliation Commission and an interview by Wolf Blitzer with civil rights activist Deray McKesson. 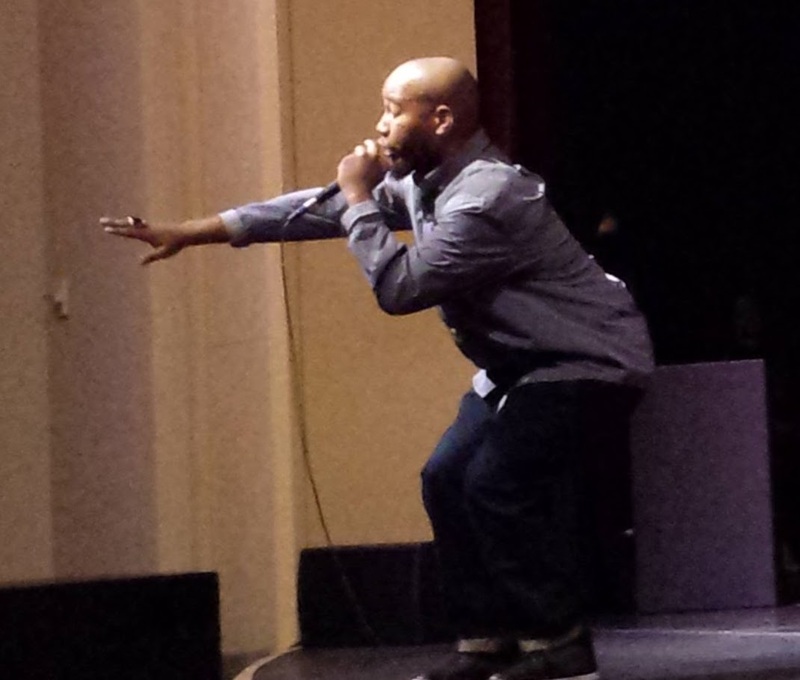 Well-known Wilmington hip-hop artist Richard Raw performed his latest hit, Shine Yo Light, in the part of the program titled “The Power of Walking Together,” encouraging the African American community to take pride in their history and heritage while shining a light for others to follow. The choreography and performances left the audience amazed at both the technical expertise and emotional connection achieved by the performers. Unfortunately, this production has only been scheduled for one performance in this region, with talks now of taking the program to South Africa. If the organizers stage another production in the U.S., you will absolutely want to experience this powerful piece of performance art for yourself. It's been over 10 years since I (as many others) saw Jamie Wyeth's fascinating paintings and portraits of famed ballet dancer, Rudolf Nureyev in the Capturing Nureyev exhibit at the Brandywine River Museum. Now we are treated to the tale behind the paintings, as playwright David Rush's Nureyev's Eyes tells an equally fascinating fictional story of the very real interaction between the two artists who would create the masterpieces. After playing in other parts of the country, the Delaware Theatre Company appropriately brings Nureyev's Eyes to the Brandywine Valley through a partnership with George Street Playhouse. Of course, the play has the connection to the area, but even if it didn't, this stirring two-man drama would still captivate. From the elaborate set of Jamie's studio to the chic 70's costumes, this production gets everything right! Oh yes...and the actors who play the artists also deliver. Told through a flashback, the 90-minute play gives a fictitious account of Jamie and Nureyev's collaboration over the span of 16 years. We watch the pair's prickly meeting at a posh Manhattan party, where Jamie's obsession to paint the dancer begins. Looking into Nureyev's eyes, Jamie sees the soul of the icon, and must make him his new muse. However, Nureyev is reluctant to work with Jamie, it takes some convincing for Nureyev to let the painter of pigs and cows paint him. Eventually he concedes to Jamie's requests and thus begins the tumultuous relationship. Through riddles, the two perfectionists learn more about each other's passions, fears and insecurities. Although they do become friends -- Nureyev even visits Jamie and his wife in Chadds Ford -- they maintain their high expectations for this work. Neither man wants to compromise his artistic integrity; and so, lofty demands are placed on each other, leading to their many arguments. Both also have great reasons for working on this project. For Jamie, the paintings will show his style and differentiate him from his family's legacy; for Nureyev, the paintings deliver him immortality. Nureyev also sees this as an opportunity for him to convince Jamie to give a good word about him to the head of the New York City Ballet -- a friend of Jamie's who soon will be naming the new Ballet Master in Chief, a job which Nureyev dearly covets. Under Michael Mastro's masterful direction, both William Connell (Jamie) and Bill Dawes (Nureyev) prove they are outstanding actors. Mr. Connell's subtle performance beautifully captures a painter who is living in the shadow of his celebrated father and grandfather, while working to make his own mark in the harsh world of contemporary art. Although subtle, Mr. Connell shows great strength when verbally sparing with Mr. Dawes, who is stunningly scary as the intense, over-the-top star. Mr. Dawes achieves the great task of creating a full character that ends up being likable. He perfectly portrays both Nureyev's explosive diva-like persona and his sensitive, vulnerable side. Although defected from Russia many years ago to become an international star, even his fame, fortune and public adoration can't replace a family he misses and eliminate his fears of being followed by the KGB. BTW - a few interesting facts learned at opening night - Nureyev is not pronounced as most people say it (Nur-e-ev), but is actually pronounced (Nur-a-ev). And the smock Mr. Connell wears in the play was loaned to the actor by Mr. Wyeth himself. Nureyev's Eyes runs through March 20 at the Delaware Theater Company. Visit www.delawaretheatre.org or call 302-594-1100 for additional information and tickets. Mamma Mia...That's Some Fun Set to Music! The US Touring Company of Mamma Mia. Photo provided. Of course, when your play’s first act is set on the day before the wedding and the second act is set on the wedding day itself and you add in the music of Abba, a cast of vocal and physical acrobats with hundreds of costumes and more than 30,000 rhinestones – then you get a dose of fun that infects The Playhouse on Rodney Square and spills joyously out onto Market Street. Welcome to the traveling production of Broadway's smash, Mamma Mia! The story centers around several trios of characters – from young Sophie Sheridan (Kyra Belle Johnson) and her friends Ali and Lisa (Kat Borrelli and Christina Eskridge) planning for Sophie’s wedding, to Sophie’s mother Donna (Eris Fish) and her lifelong friends Tanya and Rosie (Laura Michelle Hughes and Sarah Smith) still struggling to figure out how to have a successful relationship. Then, there’s the three men from Donna’s past – Sam, Bill, and Harry (Chad W. Fornwalt, Ryan M. Hunt and Andrew Tebo) – who are invited to the festivities under false pretenses. Wedding drama is always fun to watch from the outside – but in this case the drama isn’t created by a young couple unsure about their future, but rather a young bride seeking answers about her past and the generation before working through their various regrets and lingering questions. All of the performers capture the essence and effervescence of Abba while exposing a deeper layer of emotion (hope, longing, resignation, desire). You don’t have to be intimately familiar with the music of Abba to be caught up in the fun of this production. For those who grew up with the music, this is a great trip along memory lane; and for those who didn’t, this show could turn them into new fans of the Swedish pop phenomenon. The staging for this production seems deceptively simple at first, but becomes incredibly versatile as two pieces transform the set from indoor, outdoor, and alleyway locations on a small Greek island. 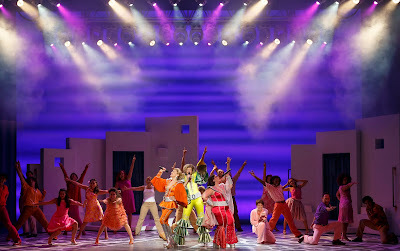 Make no mistake – this production delivers fun and gets the audience smiling, laughing, clapping, and yes, even dancing. If you’ve gone to see a blockbuster film in the past few years, you know that you probably shouldn’t leave until all of the credits have run, as more and more movies offer nice little "surprises" at the end. Likewise, do not assume that when the cast offers their bows at the end of this musical that the entertainment is over. Stay where you are and enjoy – you won’t be sorry! Mamma Mia is playing at The Playhouse on Rodney Square March 4-6. The Delaware Symphony Orchestra (DSO) both secured a place in music history and established itself as a strong contender for a 2017 Grammy nod with this weekend’s performance and recording of three double guitar concerti, including the US Premiere of El Libro de Los Signos (The Book of Signs) by Cuban composer and cultural icon, Leo Brouwer. Lending their virtuosic playing to the project was the Brasil Guitar Duo, the stunning collaboration of the supremely musical Joao Luiz and Douglas Lora. Endowed with extraordinary professionalism and technical mastery, these two young talents — who met as teen-aged guitar students in Sao Paolo — have earned critical acclaim for the sensitivity, refinement and mutual respect they bring to every performance. The near sell-out crowd was especially hushed during their performance. One might attribute that to the fact that they knew recording was in progress. But it’s more likely they were simply in awe of this breathtaking display of artistry. Luiz and Lora introduced themselves to the audience with a masterful performance of the unaccompanied Sete Aneis (7 Rings) by Brazilian composer Egberto Gismonti (b. 1947). This one-movement composition in Rondo form is based on the “choro,” one of the first forms of Brazilian urban music, which made its way to Rio de Janeiro from Africa in the mid-19th Century. The work is a study in contrasts and the duo accommodated. A wistful opening morphed into a blazing pizzicato passage before wrapping up with a lyrical and tender finish. Next came the much-anticipated US Premiere of El Libro de los Signos (The Book of Signs) by Brouwer (b. 1939), widely considered to be the most significant living composer of art music for the guitar. This work — scored for two guitars and string orchestra — features music from Brouwer’s Afro-Cuban roots mixed with traditional form. The work was composed in 2003 at the behest of Greek guitarist Costas Cotsiolis and John Williams, and premiered in January 2004 at the Megaron Theatre in Athens. According to the composer, its language uses sounds to explore its rest-motion ambivalence. The first movement features a series of variations on a theme by Beethoven. The second gives the same treatment to a more lyrical theme. The third — and most virtuosic — exhibits more of the Cuban influence. Brouwer achieves a seamless web of sound by the interplay of passages that at times have the guitars sounding like the orchestra and at other times having the orchestra play in the style of a guitar. The duo rounded out their portion of the concert with a performance of the Concerto Caboclo for two guitars and orchestra composed especially for them by fellow Brazilian Paulo Bellinati (b. 1950). The duo honored their idol — who was in attendance — with a masterful performance. Bellinati draws on Brazil’s rich musical heritage, infusing it with contemporary harmonies and techniques. The opening movement is most unusual for a concerto. In place of a fast-paced Allegro, the soloists enter with a cadenza in which they share musical materials much like a conversation. The orchestra entered only to be interrupted by another cadenza. Even as the movement increased in intensity, the music never lost the relaxed and lyrical feel of the coutryside. The second movement (Adagio) was inspired by the Brazilian songs known as modas de viola. In keeping with the question-and-answer structure of these songs, one could frequently hear rhythmic ostinatos used in one guitar as accompaniment for the other. More ostinatos are heard in the final movement, which featured catchy rhythms and flashy fingerwork. Maestro David Amado’s meticulous direction of the orchestra’s dynamic levels ensured that the soloists were never overpowered. The second half of the program was devoted to a performance of Hector Berlioz’s Symphonie fantastique, an opium-filled tale of love, obsession, betrayal and murder. In his pre-concert remarks, commented on how Berlioz, who made significant contributions to the modern orchestra with his “Treatise on Instrumentation,” took an abstract form — the symphony — and used it to tell a story. And while symphonies that followed a program had existed before, most notably Beethoven’s Pastoral, Berlioz took the process to its logical conclusion with every note geared to the specifics of his p lot. That accomplishment as well as his use of the “idée fixe” would go on to inspire composers like Wagner and Liszt. This truly iconic work poses a challenge to any conductor: Do you play the music and let the story take care of itself, or do you help it along? Amado’s reading is absolutely on the right side of sentimentality. His interpretation bristled with desire and intention. The first movement was playful and flirtatious. The ball waltzed itself into sheer delirium. As the music turned dark, Amado followed suit: the rhythms were unyielding; the mocking of Berlioz’s hero filled with spite. He kept the momentum going beyond the March to the Scaffold. The Witches’ Sabbath with its growly brass and tense strings sustained the nightmare to the very end. And let’s not forget the punctuation of the requiem Dies Irae by The Bells of Remembrance, which are featured in each concert of the DSO’s Classics Series this season.